Butterfly: Resurrection of Jesus and Eternal Life for God’s Children. Four corners of window: Flowers, Color blue relates to open sky. All are common flowers representing the common people who enjoy freedom in our land. Quilt by John Milton, an English poet of the 17th century who held strong Puritan views and was at odds with the Anglican Church of England. 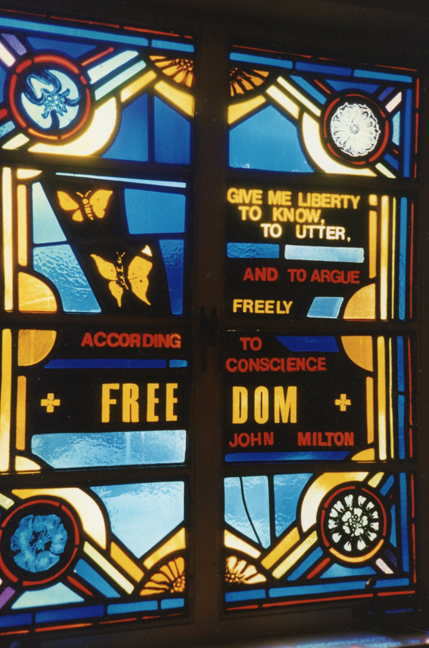 Give me liberty to know, to utter, and to argue freely according to conscience.